We’re back again with a look at trade candidates, fantasy football players you might want to add based on possible production heading into Week 6 of the NFL season. Affectations, or the artificial inflation or deflation of value because of fads. Here are my FLEA market finds for Week 6. Smith salvaged his fantasy day with a rushing touchdown, but I imagine the perception of his value is at a season-low following the Redskins big loss at the Saints on Monday night. You shouldn’t be surprised by what happened. The Saints allow 5% fewer passing touchdowns than a typical team, and quarterbacks tend to perform worse on the road than at home. Smith is in line for a nice rebound playing four of his next five games at home and against the Cowboys (twice), Giants (twice), and Texans over the next two months. Those defenses all allow 25% more touchdowns than an average team. In fact, Smith won’t face a defense as difficult as the Saints for fantasy purposes until he takes on the Jaguars in Week 15. He’s an excellent bye-week fill-in and deep league option, and I expect Smith to be starter-worthy in even shallow formats the rest of the season. Michel eased concerns from his poor performances in Weeks 1 and 2 with a touchdown and 100 yards from scrimmage in back-to-back games. But as optimistic as fantasy players are of Michel, I don’t think his market values has reached its peak. That should happen after the Patriots play their next three opponents, the Chiefs, Colts, and Bills. The Chiefs and Bills defenses allow 25% more rushing touchdowns than at typical team. They represent the two best matchup plays for Michel for the rest of this season. Keep and trade for Michel now to take advantage, and then consider moving him when his schedule gets tougher in Week 9, when he begins a four-game stretch of minus matchups, including the Packers and Titans, which are among the five most difficult teams to score rushing touchdowns against. Adrian Peterson may not miss any more time because of the shoulder he dislocated on Monday night, but things are less clear for Chris Thompson, who suffered a late-game rib injury. As weird as it sounds, I think Thompson is the easier player to handcuff. Bibbs is 5-11 and 203 pounds, and he has added about the same total of yards (19) as a receiver as he has cost (-18) his teams as a runner since the start of 2016. It’s a limited sample, but Bibbs has actually added more than a yard per catchable target over that stretch, which is an impressive benchmark. Thompson, Todd Gurley, and Austin Ekeler are the only backs who did the same with heavy target volumes since 2017. Bibbs should inherit Thompson’s role and be a flex consideration in PPR formats in whatever weeks Thompson sits. On a Cleveland team full of more famous names, Rashard Higgins may not seem like a big loss. But Higgins has actually been the Browns most efficient receiver so far this season, adding 16 yards relative to a typical wideout on his catchable targets. Some of those targets will move to Antonio Callaway (-12) and David Njoku (-23) while Higgins recovers from his MCL sprain, but they have both hurt the team with their efficiency so far this season. The Browns could really use an extra option, and Matthews flew in for a workout on Monday. As I’m writing this, he hasn’t signed, but I think it makes sense to get him on your medium and deep-league rosters now while we wait for it play out. Matthews is one of the most underrated receivers in football coming off 54 Yards Added 2017 season and could become a flex-worthy option during these bye-heavy weeks if he signs. Woods probably could have been an injury trade target since teammates Brandin Cooks and Cooper Kupp both suffered concussions on Sunday. But Woods’ efficiency makes it clear to me that he can be a solid fantasy receiver the rest of this season even if his teammates are healthy. Unlike most fantasy-relevant receivers who break out with a performance spike in their second or third season, Woods has slowly improved as a player over the last six years. 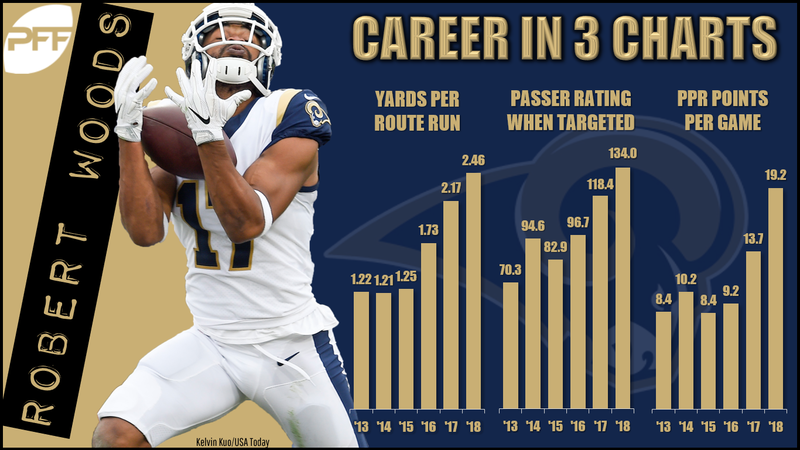 Now, he has become one of the most efficient receivers just in time to become a featured player in one of the league’s best offenses. I don’t think he can maintain his pace as a top-10 fantasy receiver, but he’s a solid WR2 who may not cost that much. This isn’t the first time I’ve highlighted Jones in this space or mentioned that he and teammate Jamaal Williams are tracking in opposite directions with 12 and -11 Yards Added, respectively. But I continue to insist that Jones is an attractive trade target because I just can’t believe this workload split can continue. It’s not just that Jones has the better total numbers; he’s also been dramatically more consistent. Jones has overachieved his expected yardage total in six of his eight career games with five or more carries. That 75% quality game rate trails only Marshawn Lynch and Jay Ajayi among 62 qualified backs since the start of last season. Williams, in contrast, is near the bottom of that list with a 23% quality game rate. Jones is overdue for an uptick in his workload, and with his efficiency, he can convert moderate touch totals into RB2 numbers. Trade for him before it’s too late. The list of exciting young quarterbacks has gotten pretty long, and Beathard is at the bottom of it. He hasn’t been picked up in any of the deep and two-quarterback leagues I play in, but after an excellent fantasy performance in the 49ers’ loss to the Cardinals on Sunday, I’m thinking that is a mistake. Beathard ran in a touchdown on one of his two carries and now has four rushing scores in his career. Rushing touchdowns are often subject to regression, but Beathard’s are supported by his seven red-zone carries in eight career games. By rate, that trails just Cam Newton (33/20), Deshaun Watson (15/12), and Blake Bortles (20/21) among current starters with at least eight games played from the last two seasons. It may not be pretty, but Beathard could sneak into the high-end QB2 range with Tim Tebow-like performances.